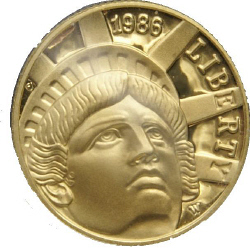 The 1986W, Statue Of Liberty, Gold $5 Commemorative was the first gold coin to minted bearing this denomination in over 50 years, and is the same weight and size as the previous half eagle, U.S. Gold Coins. 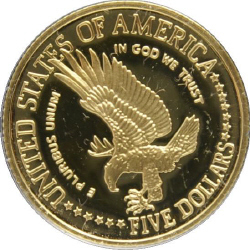 It was designed by Elizabeth Jones and all where minted at the West Point mint and bear the W mint mark. It came in proof and business strike versions.